I am back in Singapore, and once again, in the forest every night! I am very excited for the research going on here, and I didn’t realize how much I missed being in the tropics! Singapore has surprisingly good herp diversity. It makes every night a treat with good chances of seeing many different species. 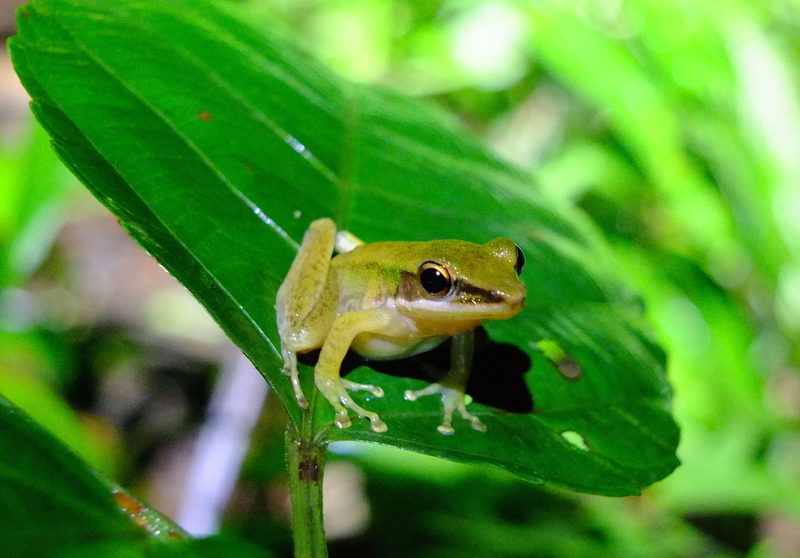 Here is a very cute frog, the Forest Greenback (Hydrophylax raniceps). Greenbacks are a small Ranid that happens to be semi-arboreal. In some areas within the Central Catchment area of Singapore, this species may be the most common species encountered on a wet night when away from the edge of streams. They usually perch on low foliage about 70-100cm off the ground. Greenbacks are also not very skittish and can be easily approached and photographed. In some areas I have viewed two possible forms of the species and some authors (e.g. Baker and Lim 2008) have also suspected that it may in fact be two species. The last couple nights out I did not find the other form, but it is slightly larger and it can be darker? Initially I thought they were just large adults and not another spp? However, in some areas I have never found the larger form, but the smaller variety was plentiful. It is always amazing that even in Singapore, a techno-savvy city state, there are still major questions of taxonomy and ecology on species “right across the street” that haven’t even been approached.